Energy consumption is one of the few costs business owners have control over every year. Being a green business doesn’t just help you save the environment – it can help you save dollars as well! While this sounds like a very basic task, a cleaning schedule is a good first step to making your kitchen energy-friendly. Carbon and grease buildup on key equipment (like griddles and fryers) can make them work harder, costing more in energy. Regular cleaning can keep your kitchen equipment to run in peak condition. Refrigerators and freezers take a lot of energy to begin with. If the door seals are loose, then your commercial refrigerator or freezer will work harder to keep everything cold. This not only adds more to your power bill, but also causes unnecessary wear and tear. If your refrigerator isn’t latching correctly, or your door isn’t completely sealed, make the service call to CPS today. Is your range hood working properly with the rest of your ventilation systems? Improperly balanced ventilation systems and range hoods can take more energy to keep running. Have your range hood inspected regularly to keep it running in harmony with your kitchen. 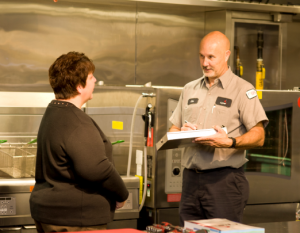 Ready to keep your kitchen running at full capacity with regular service? Contact CPS today to start saving money on running your kitchen equipment! Are You Getting the Most Out of Your Commercial Deep Fryer? Ask A Tech: What Can I Do About A Poorly Heating Oven?